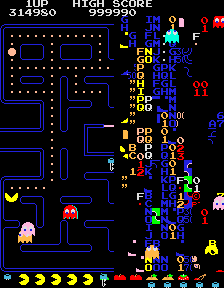 In the wiki spirit, everyone is invited to upload their favorite Pac-Man patterns to this page. In order to assist you with making that possible, please click on the Pattern Template thumbnail and use the image contained there. 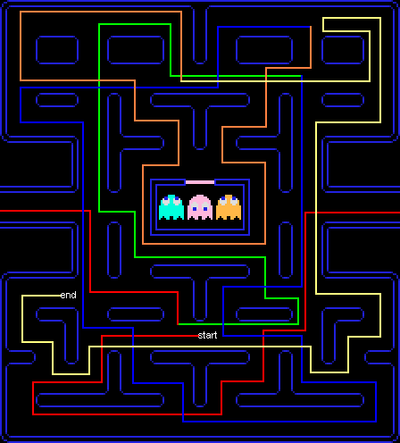 This pattern won't clear the level entirely, but it should leave you with two power pellets and just a few dots remaining on the upper half of the screen, which is the easier half to clear. This is the basis for a pattern that should get you through to the key stages. It should work as is on the cherry stage, but it will take a little tweaking to use in later stages. On the cherry stage, you should reach the first power pellet in the southwest corner just as three ghosts are entering that section from the other direction, and Clyde is just leaving the ghost pen. In later stages, it may look as though you will collide with Blinky before you enter the tunnel, but he should never be able to catch you. Around the apple stage, it becomes necessary to hesitate above and to the right of the ghost pen until Pinky enters beneath you and travel down and past the fruit. You can safely follow behind him until you reach the power pellet. The pattern should have you arriving in time to pick up the first fruit of the level. Since the pattern is a little more open ended, you should feel free to pick up the second fruit if it's safe to do so. Before grabbing the second power pellet in the southeast corner, I like to do a little "clean up" in the alleys to the left of the pellet. If you don't feel that it is safe to do so, grab the pellet first and then clean up the remaining dots. This pattern created by Ben Goodrich gets most of the dots and both fruits. At point A where you get the second fruit is freestyle time. Pattern works for lvls 2, 3, and 4. Pattern created by Ben Goodrich and clears all the dots. 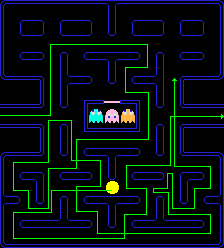 Pac-Man Pattern for the 21st level and higher created by Ben Goodrich. This patterns gets all the dots. This pattern should take 53 seconds to complete. 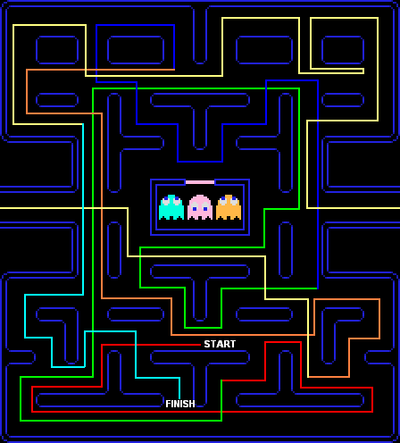 This pattern was learned by watching people in the arcades, for the 5th board (apple) and later. It takes you through both fruits, and leaves only the immediate dots surrounding the energizers. You approach Pinky head on, and right as you're about to collide, duck to the right. It won't work if your timing is slow (like getting stuck somewhere, even if you've done everything right). Pinky is right on your tail (sometimes literally!) through this entire lap. Again, if you're slow, he'll catch you. If it looks like you won't make it, you'll have to cut away somewhere and abort the pattern. Sometimes, probably from being a few pixels off somewhere, things will be off, and Pinky will end up a bit further behind you. So there will be no danger of him catching up to you, and even though all the other monster positions will be different (Like you won't see #4 at all), this pattern will still work. On the upper levels, beginning with the third key when the pattern changes slightly, Blinky will cut you off here. (This due to him speeding up earlier, when his "Elroy" dot count goes up). Head back the way you came, around that block, and pick up the pattern around the pen, through the key, etc. You'll have to go back for any remaining dots later. Now, all the dots, except the ones surrounding each energizer, will be cleared, You have your pick of which one to head for. If you head for the lower left first (the inner path next to the pen seems safest), the monsters will usually gather down there together and be nearby when you eat the energizer. For lower board versions of this pattern, since the monsters are slower, it basically involves stalling along the way, sometimes going around an extra block or something, and then continuing along the pattern. a. On the cherry, duck to the side and eat the two dots first, then go back and resume the pattern. This will give Pinky time to get in position for point 1, and then they'll pretty much move similar, allowing you to grab the fruit, and continue the pattern to point 2, with Pinky a safer distance behind you. Where you may get hung up, is right before point 3, clearing Blinky's area while he's patrolling it. 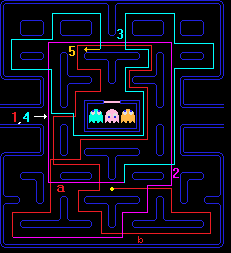 This is the point at which they reverse, going into chase mode, and then not only him, but also Pinky come directly after you and trap you at point 3 (and you've already likely skipped over some of the dots to the right to avoid Blinky when he reverses). b. On the strawberry and oranges, stall a couple of times in this area, and then clear all the dots around the block at point a. (left two first, then counterclokwise). This will give Pinky time to get in position for point 1 and beyond. You may get through point 3 with this, but since it's hard to make the same exact stall move, the results will come out differently. A monster may cut you off right before point 2 when coming up from beside the "T". You may still run into the problem right before point 3. When you reach the ninth key, it will continue until you reach the 256 board. This is the split screen. There are patterns for this, and also nine hidden dots on the right side. If you have five men, you can lose a life and gain 90 points, resulting in a maximum score of 3,333,360. Also, don't forget that a bug will let you pass through the ghosts unharmed. This page was last edited on 8 September 2016, at 02:16. This page has been accessed 72,766 times.